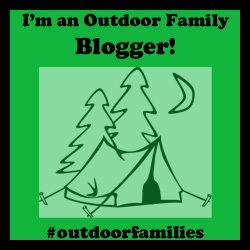 No Longer an Outdoor Mama…..?! It is not always easy to get outdoors and sometimes staying inside can seem a lot easier. Sometimes staying indoors may even BE easier. This past week it was incredibly difficult for me to get the girls out of the house. The weather was cold and by cold I mean -30 with the wind chill. Anytime we would be outside my 1 year old would end up in tears and a tantrum. We were struggling to get outside. It was extremely discouraging. I started to feel like I was no longer an outdoor mama. I felt defeated. The outdoors makes me feel alive and it was now driving me absolutely crazy. It’s not that I have never played outside in this cold of weather but I have never had to with children since we were living in Vancouver up until this year. I had to take a reality check and re-evaluate our family goals. I changed my goals for the week from “let’s adventure outside everyday” to “lets survive”. Instead of fighting the need to get outdoors I decided that we would spend more time inside. We baked, played, danced and crafted. Slowly as the week progressed we got used to the weather and started venturing outside for 10 minutes at a time. Although my 1 year old cried for the last 5 minutes of those 10 minutes outdoors, I loved seeing my 3 year make snow angles and we had a blast building pretend fires. The weather is apparently going to warm up next week but the cold is going to return again. Next time it comes I have come up with 7 points to help me. And Hey! They might just help you too! This about sums up our week, too! No adjustment period for us at all this year, eh? My 5 year old was game for almost anything, but the 2 year old was having nothing of it (and is teething her molars, ta boot). I have officially come to accept that she is physically stronger than me and she has come to realize that I am smart and right when suggesting to wear a neck warmer! One morning we walked the 10 minutes or so to kindergarten drop-off, then when we turned around to go home the quick release axle on my chariot jog wheel sheared and I had no jog wheel, a kid that didn’t want to go in the chariot and wanted to go to school with her sister, so I had to buckle her in and close the cover on her and she screamed bloody murder the whole way home (don’t worry, she was warm) – it nearly broke me. Ha! So, we had small walks around the block and I have fully embraced #4 so that I can squirrel away on my computer, planning bike touring trips in warmer climates or warmer times of the year! Guilty. Not guilty. I have survived with my sanity somewhat in tact. The one really great thing that came out of that outrageous week of cold, was that not -10/-15 doesn’t really feel all that hard, ha! And, I was fully reminded of how life in Calgary can really be an exercise in carpe diem when it comes to the weather. Thanks for your comment! What a brutal day! I hate when nothing goes right and you just have to keep them safe and let them scream so you can get somewhere. Definitely has happened over here for sure! I have been working on getting rid of the guilt because really I am just doing my best. Besides keeping ourselves sain helps us take better care of the kiddos. And I completely agree that the -10/-15 is not at bad now which is good news (Bright side>!) We actually had a fun time outside today. Both of my kiddos. It was definitely a tough week to get outside! My oldest had a cold, so we drove her to school (usually walk, but 3 km round trip with a 5 yr old is a long time outside! ), then made time for a bit of outdoor play afterschool… but it wasn’t as long as usual. Totally agree it’s better to get outside for a bit than not at all! For your sanity! Glad we are not the only ones! Now we are able to venture out a little more and the youngest is not so upset which is really helping! I hope your oldest gets better soon! We have been fighting so many sicknesses this year its a crazy year! When you have a goal to get outside and you can’t it can feel like you failed. We don’t have the cold weather, but with my broken leg I just can’t do it. Then the mom guilt starts to set in after the third episode of dinosaur train. I love your list! And number 7 is spot on. I have been working on bringing more outdoors~indoors. The sicknesses have been crazy here too! I can’t believe how much we have been sick. It makes everything so much harder. I totally agree that when kids are young it is just a season of life and we need to go easy on ourselves! At least I need to go easier on myself. I think I sometimes forget that they are still so little and to just enjoy the simple things with them. I have been there. Some weeks it is so hard to even out on “real” clothes let alone actually get outside with the littles. We have lots of puzzles, coloring/activity books, and board games for such days. On those days, I welcome bedtime and plan to start the next day with more determination. I know what you mean about real clothes and those are great tips and ideas! We just got some puzzles and board games for Christmas so we will for sure have to take them out especially on those hard days. I definitely have been really enjoying our recent outdoor adventures especially since it had just been really hard to get outdoors.